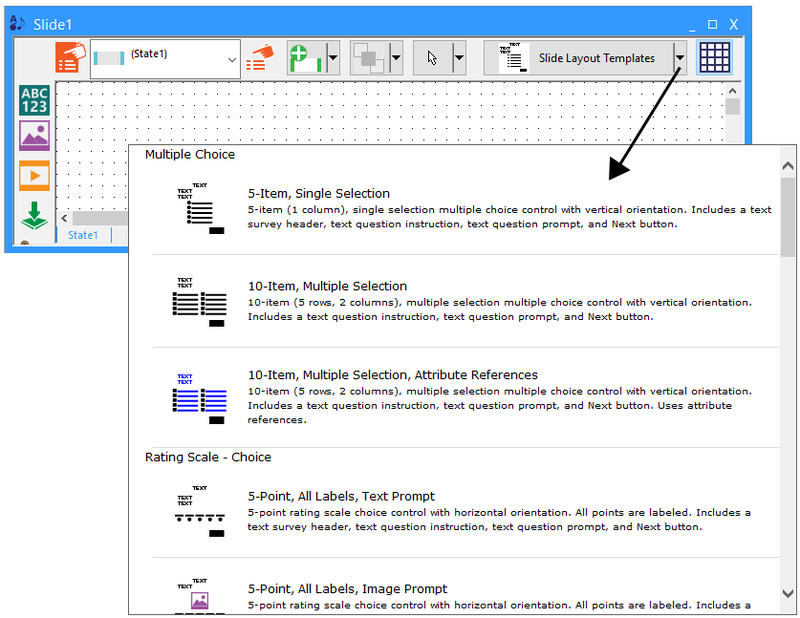 The Slide Layout Templates (SLTs) within E-Prime provide multiple layout options as a starting point for Slide object design. 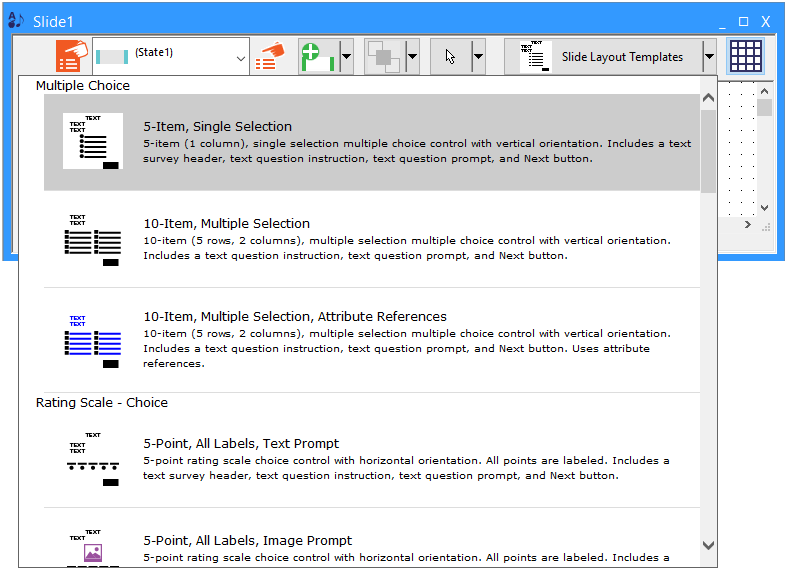 Available via the Slide object toolbar, the Slide Layout Templates provide various categories of layouts, including Multiple Choice, Rating Scale – Choice, Rating Scale – Slider, and Other (e.g., grids, number pad, etc.) layout options. 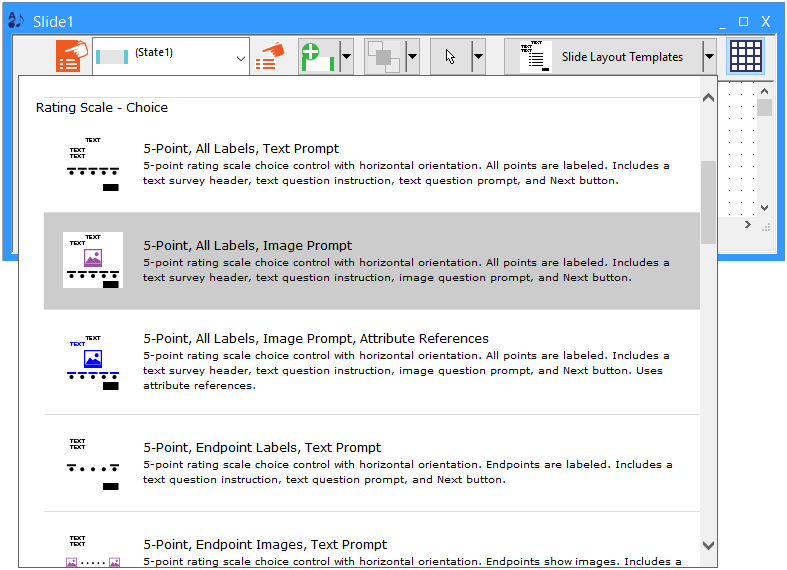 Each template appearing in the dropdown is accompanied by an icon representation of the contents of the SLT (e.g., the 5-Item, Single Selection icon represents the 3 SlideText, 1 SlideChoice, and 1 SlideButton sub-objects composing the template). 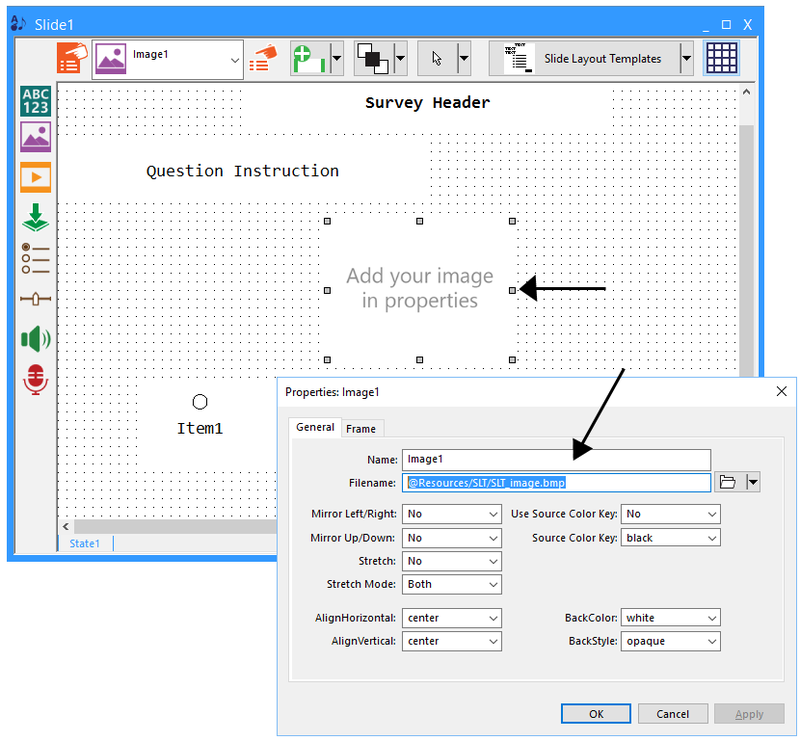 Use of a Slide Layout Template will configure the desired layout (as determined by selection of a specific SLT), as well as the Input Source, Input Mask, Allowable, and Duration fields. Therefore, Slide Layout Templates are typically only applied to a new Slide object to avoid overwriting previously created components. Once applied, the layout may then be customized to meet the needs of the experiment design (e.g., additional text, images, etc.). To apply a template to a Slide object, select a specific SLT from the Slide Layout Templates dropdown menu. You will be prompted to confirm the operation, and a notification will be displayed upon successful application of the SLT. Some Slide Layout Templates make use of attribute references. The icon representations for the SLTs that require attributes appear in blue in the Slide Layout Templates dropdown menu. 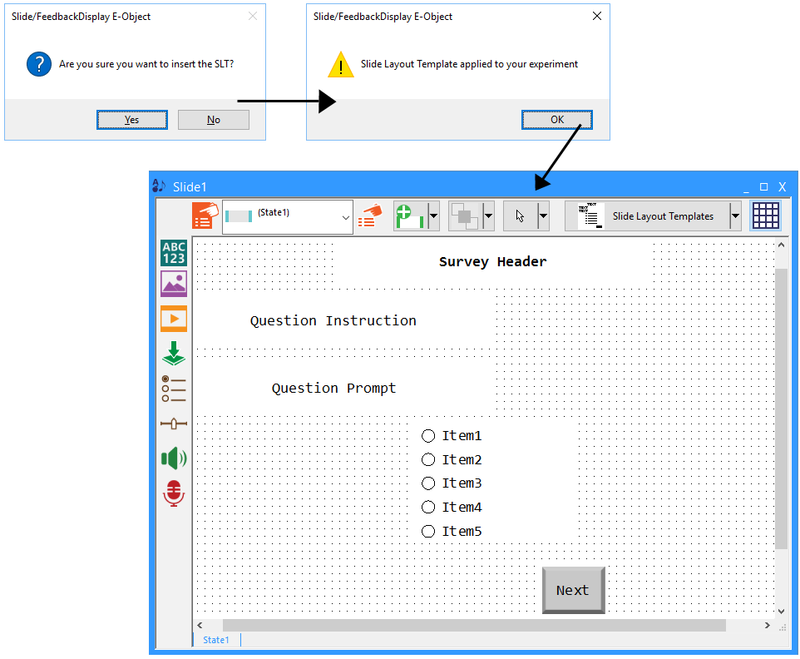 For use of these SLTs within the experiment, the attributes required by the SLT must be created and assigned values (i.e., in a List object, or through user-written script). Some Slide Layout Templates make use of image, audio, or movie resource file references to serve as placeholders during design. These references provide a temporary resource to allow an experiment to be run prior to the assignment of user resources. SLTs that include sub-objects to present images, audio or movies may be identified by the icon representation in the Slide Layout Templates dropdown menu (e.g., in the image below, the 5-Point, All Labels, Image Prompt template includes a SlideImage sub-object that requires assignment of an image file). 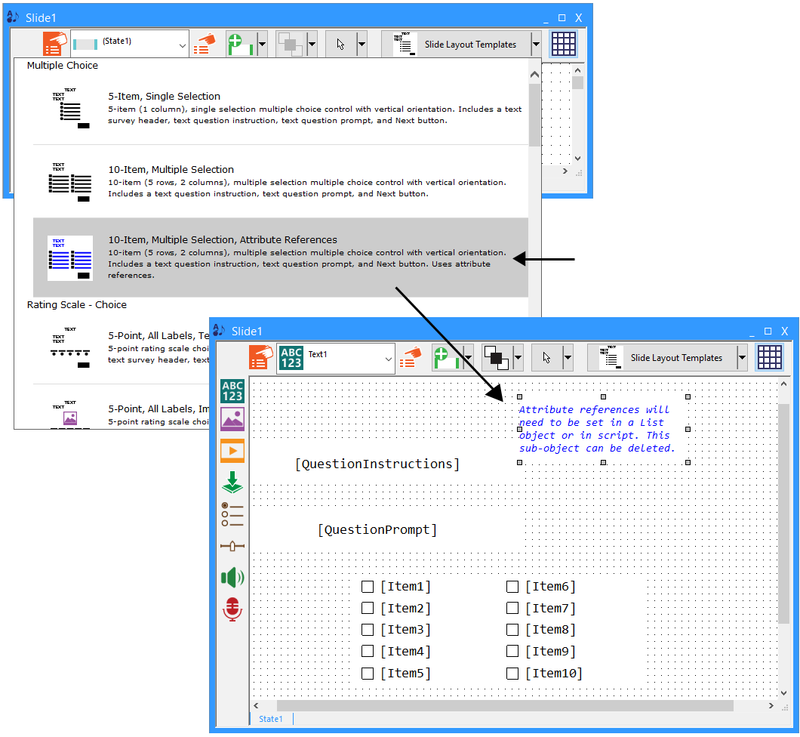 Note that SLTs involving attribute references also appear in blue (see Attribute References section above), as illustrated by the icon representation for the 5-Point, All Labels, Image Prompt, Attribute References template in the image above. Once the desired SLT is applied, select the sub-object requiring the file assignment, and display it’s Properties pages to modify the Filename specification. See INFO: Using Forward Slash (/) When Loading Files from a Specific Path  for information pertaining to specification of file location. Note the use of the @Resources convention in the Filename field. A set of resource files of various types (e.g., images, icons, sound files) is included as part of the E-Prime full system installation (C:\Program Files (x86)\PST\E-Prime 3.0\Resources\), and a shortcut (i.e., @Resources) is automatically provided when selecting or referring to a system provided resource file. When navigating to or specifying an absolute path that is associated with the root folder of the system-provided resources (C:\Program Files (x86)\PST\E-Prime 3.0\Resources), the value is translated to a shortened path with “@Resources” replacing the portion of the absolute path of the resource image area. If the “@Resources” shortcut is explicitly typed in, it is likewise translated and accepted as a valid path.